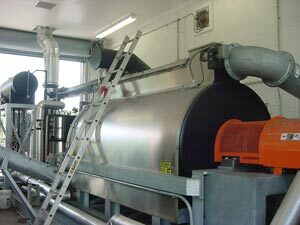 The processing of the residual solids (sludge) consists of thickening, digestion, de-watering, and drying. The processing of solids results in a final product called BioSolids, which is recycled for beneficial uses. Excess amounts of activated sludge are continually generated in the Oxidation Ditch by the growth of the microbial mass and the accumulation of solids. To maintain a constant optimum concentration of activated sludge, this excess sludge must be removed (called “wasting”). This “waste” activated sludge is pumped to the Dissolved Air Flotation Thickener. This process blends the sludge with pressurized, air-saturated water. This causes water to separate out of the sludge and the sludge to float to the surface and thicken. 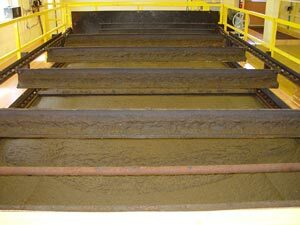 The Flotation Thickener will concentrate the thin (½ % solids) waste activated sludge up to about 6% thickened sludge, thereby removing much of the water prior to further processing. This thickened sludge is pumped to the Anaerobic Digestors. Digestion is a biological process that reduces the amount of organic (volatile) solids in the sludge, stabilizes the organic content, and reduces odors. The sludge is mixed and heated to maintain the proper environment for the anaerobic bacterial activity. This process takes about 30 days. A bi-product of the process is methane gas, which is used for fuel to heat the sludge, making the process self-sustaining. Digested sludge, which is removed from the bottom of the Digestors, is a black, homogenous liquid having a solids concentration of 2%-4%. At this point, the quantity of total solids that were fed to the digestion process has been reduced by as much as 50% through the decomposition of the volatile solids into methane, carbon dioxide, and water. Digested sludge is then pumped to a Centrifuge, which de-waters the liquid sludge into a cake-like material. Sludge is first conditioned with coagulant polymer, then passes through the centrifuge, a cylinder-shaped bowl which spins at about 3500 revolutions per minute (RPM). In a very short time, the high gravitational forces in the centrifuge will separate out about 75% of the remaining water in the sludge. The g-forces in the centrifuge bowl are over 2500 times that of normal gravity. The remaining sludge cake material, at a solids concentration of 20-25%, is then conveyed to an intermediate storage hopper prior to the drying process. Dewatered solids are fed to a BioSolids Dehydrator (dryer). Solids are heated to about 210 degrees F° to evaporate all of the remaining water content. This is a batch process which takes about 3 hours for each batch to complete. Hot oil (450 F°) is circulated within the drying chamber to raise the temperature of the solids. The resulting granular material, now called BioSolids, has a dry solids content of about 90%. For purposes of land application, the BioSolids meet all Class “A” standards under EPA Regulations-Part 503, and also meet Pennsylvania DEP standards as “Exceptional Quality”. Under these regulations, the material may now be distributed as a soil conditioner and fertilizer. 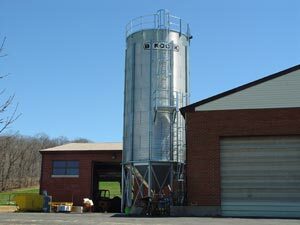 Dried BioSolids are stored in a 155 Ton capacity Storage Silo, prior to distribution to land application customers. BioSolids are produced by CNBTJSA under the name C'n'B Green. Information about obtaining and using C'n'B Green may be obtained from the Authority office.